This year, let's all welcome back the breakers from Hawaii as New Image Production mounts once again its Philippine Breakdance Tour. 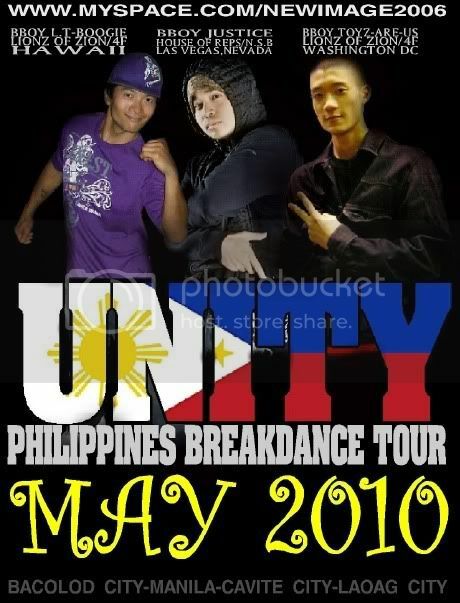 True to its endeavour, the breakdance tour is a project to unite and help build the Philippine B-boy Community and also to bridge the gap between US and the Philippines via the art of b-boying. Since 2008, they have been bringing in b-boys from Hawaii. Having done their month-long breakdance competition tour from Bacolod (Battle Mania 2010), Cavite (7 Deadly Styles) and Laoag City (Breaking in the North), now is there time to conquer Manila (Breaking Grounds 2) tomorrow, 4 pm at Mandaluyong City Gym, Maysilo Circle. To all interested crews out there, contact Tin at 09107400374 or Weng at 09055004927. E-mail your full names and aka's to jug@pinoyhihoppaz.tk immediately for your IDs so your crew won't have to pay the entrance fee. Breaking New Grounds 2 is the Manila segment of New Image Production's Philippine B-boy Tour and a side event in the Hip Hop Palooza. Entrance fee is Php 150.